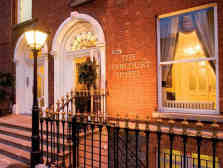 For the guest who wants to enjoy the splendour of Georgian beauty in the heart of Dublin the Harcourt Hotel is ideal. The former home of George Bernard Shaw the famed Dublin writer who continued to be a literary genius even in to his nineties. The hotel has been renovated to the highest standards offering all the comforts of a modern hotel while preserving its original style and character. So for business, pleasure or leisure or a break away from the humdrum of day to day chores the Harcourt Hotel offers the perfect haven of beauty. As the great man himself said “The great advantage of a hotel is that it is a refuge from home life”. The Hotel offers 104 beautiful appointed charmingly decorated bedrooms offering all the facilities necessary for convenience and comfort. 50% of them are located in the main hotel and the remainder is located in a recently opened extension located one door away. The bedrooms are designed to preserve the classic Georgian elegance and beauty of the original building. All bedrooms are ensuite and facilities include direct dial telephone, multi-channel remote control television, hair dryer, trouser press and tea and coffee making facilities, 24 hour room service and safe deposit box. The rooms are all elegantly furnished and many guests return time and time again.Please note: as there is no-smoking allowed in any Irish bar/restaurant, the harcourt hotel has an outdoor patio where clients can smoke. This may be busy and guests in rooms overlooking the patio may find it noisy. Wining and dining in The Harcourt Hotel is an experience not to be missed. 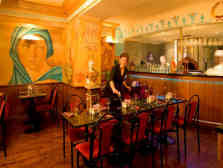 The hotel is home to Little Ceasar’s a fine restaurant offering a full range of Mediterranean and International cuisine cooked and presented to the highest standards. D-Two is a late bar in the Harcourt Hotel which is open seven nights a week and offering a fine Carvery lunch and a bar food menu in the evening. Excellent food to satisfy any hungry appetite. D-Two nightclub is open Wednesday to Saturday, and an added bonus is that guests have free entry to this popular nightclub. 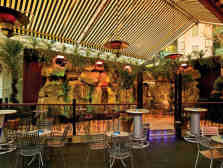 The hotel also boasts one of the finest all weather beer gardens in the city. The hotel is in the ideal location situated on Harcourt Street, it is right beside all the good things that Dublin has to offer. The Gaiety Theatre, St Stephens Green with its lovely park and shopping centre and Grafton Street famed for its wonderful shopping are all just a short wander from the hotel. The new LUAS tram system stops right outside the hotel and provides easy access to Europes's newest and biggest shopping centre in Dundrum!